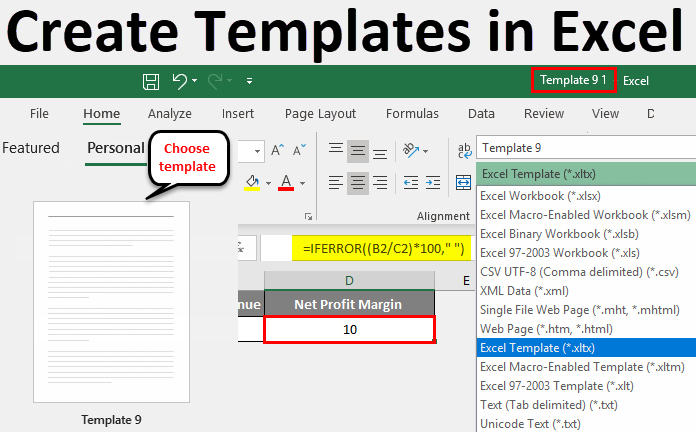 Create Templates in Excel (Examples) | How To Create Excel Template? 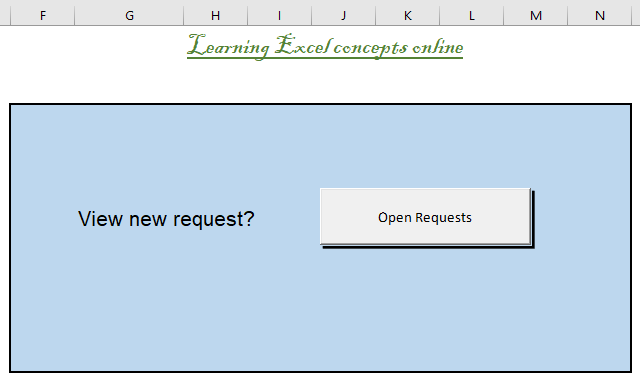 How to Create Templates in Excel? 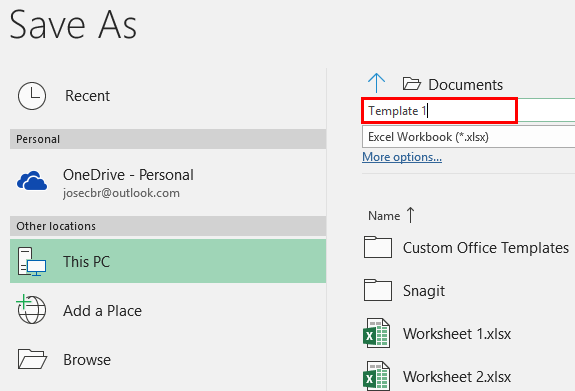 In Excel, a template is a separate file that is saved with an extension which is different from normal workbooks. It serves as the base for new files. Templates can contain a wide range of content and configurations which are applied to all new files that are made from the template. 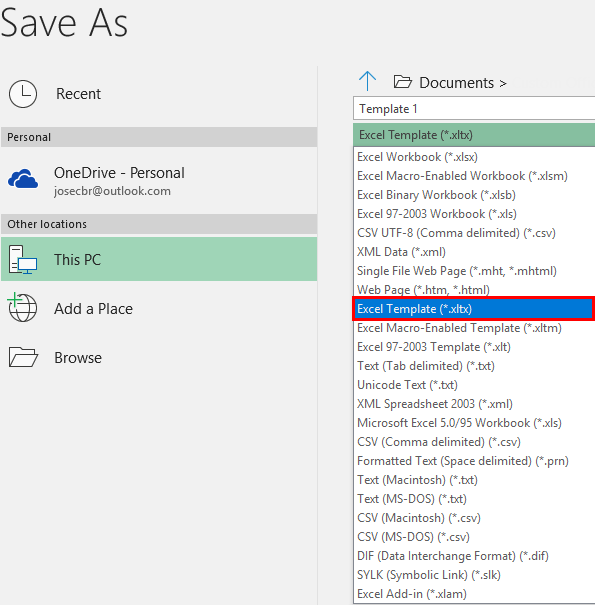 Templates can be made by saving an excel file with a specialized extension and then saving the file in a specified directory. What type of content can be stored as a Template? Text data can be stored as a template. Various sections of a document such as page titles, column and row labels, text and section headings, any cell in Excel that contains text or numbers, or any kind of data can all be included in a template. We can also include any graphical shapes, logos of companies, or any type of background image and even Excel formulae into templates. Along with the data, the type of text formattings such as font or color or size can be saved as a template. Formats of cells or worksheets, such as column width, or background fill color or alignment of text and even formats of numbers and dates, and a number of sheets can be saved in templates. What are the advanced features that can be saved as Template? 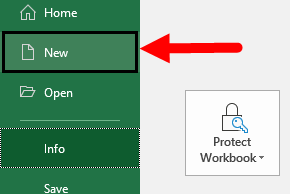 All hidden and protected areas such as locked cells which cannot be altered and hidden columns and rows, or even worksheets that may contain data that is not meant for general view. All Macros are specially customized toolbars that may contain options that are frequently used, macros, as well as the quick access toolbar, can be saved as templates. To create a template in recent versions of Excel, there is actually very little work that has to be done. 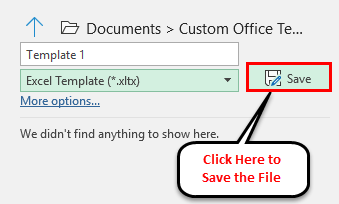 Excel 2013 & later versions – Prior to saving a file as a template, one has to define the custom template directory. 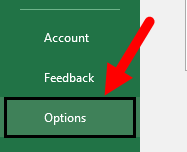 Select the option Save in the menu ribbon. Find the option Default personal templates location among the various options. Provide the choice of a directory where you want to save all the templates. Documents\Custom Office Templates is regarded as a good choice. Firstly, go to the File. Now, the option to provide a name to your template file appears. Click on Save button to save the template. 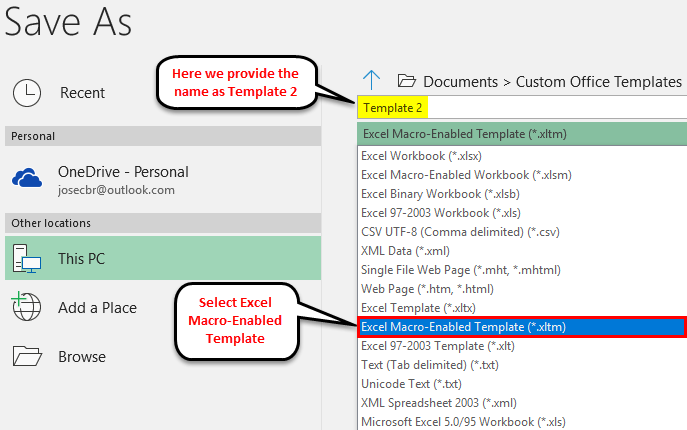 Note: It is better to choose “Excel Macro-Enabled Template” (.xltm) for cases where the workbook might contain macros. 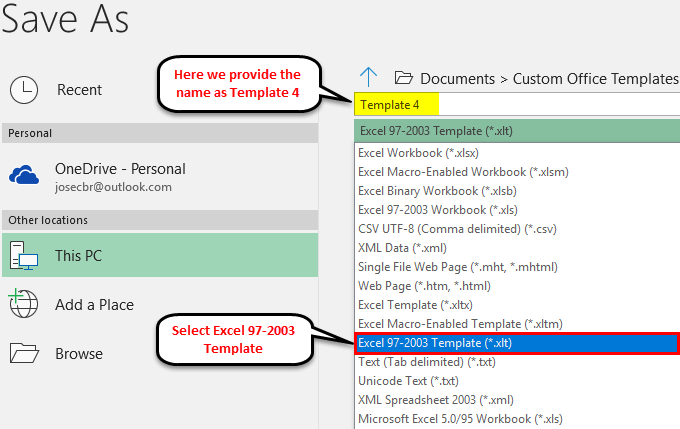 “Excel 97-2003 Template” (.xlt) is to be chosen for the cases where the version of the Excel workbook is very old. 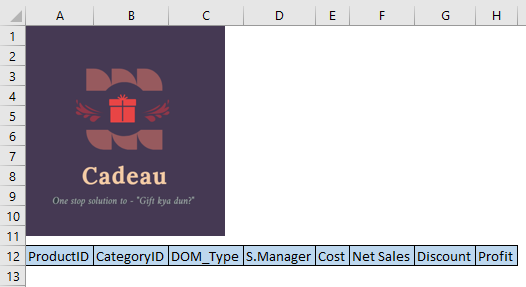 “Excel Template” (.xltx) should be chosen for all other cases. 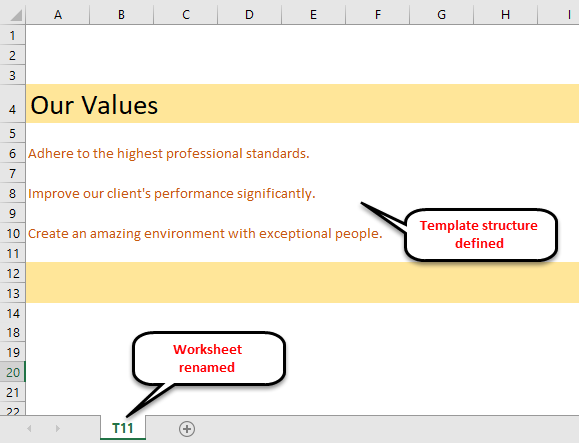 Below are some examples to create templates in excel. Now, firstly we will make all the changes in a new file, modify it till all the items that you wish to save in the template is ready. Then you have to save the file as a template. Template files have a special extension. In the screenshot above, we have added an image and text as the structure of the template. Now we shall follow the steps below to create the excel template. Step 1 – Firstly, go to File. Step 2 – Click on Save As. 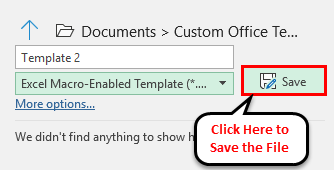 Step 4 – Click on Save button to save the template. 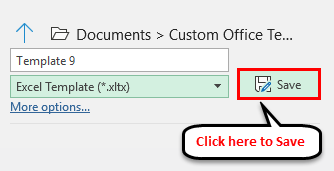 Now, automatically, Excel will place this template file in the appropriate directory. 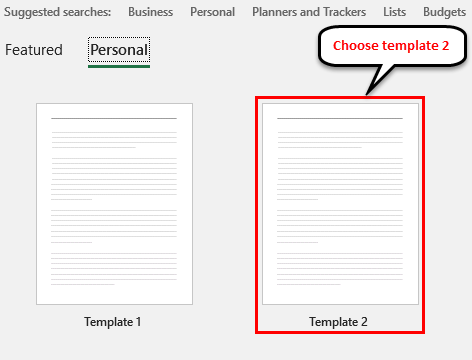 And new Excel documents can be created based on this template file by navigating and choosing “Personal” in the new file window (which is right next to Featured) and then choosing the appropriate template. Concepts always become much clearer when we have more examples. 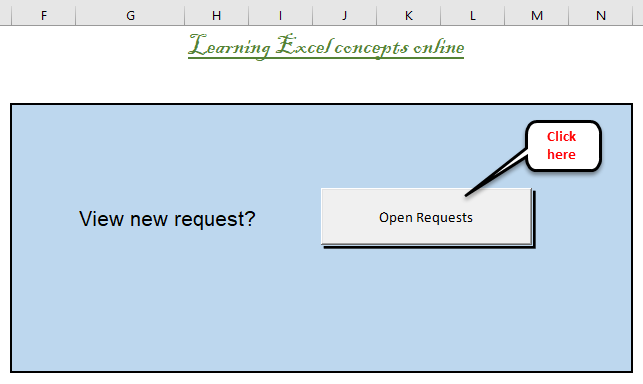 So, let us look at yet another examples to create Excel Templates. 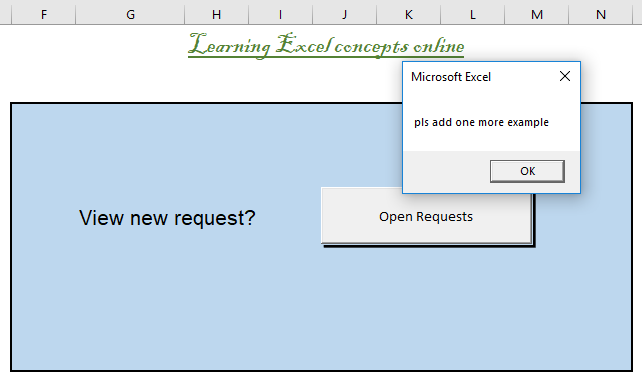 Let us now explore how to save a Macro-Enabled Excel template through an example. 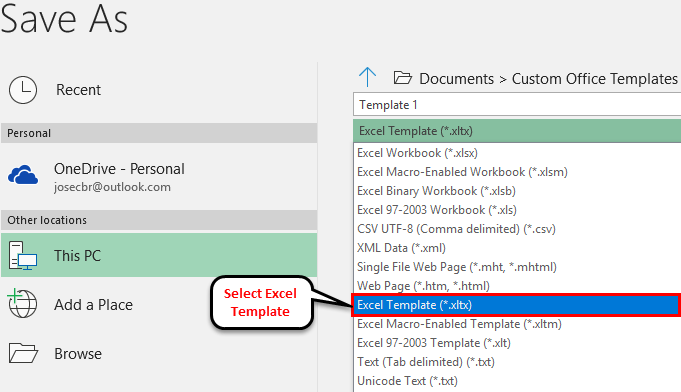 Suppose we have an excel with some macros(s) that is to be used as a base for other files, then we need to save this Excel as a macro enabled excel template. In the screenshots above, we have added a macro in the template file and now we shall proceed to create the template in excel. 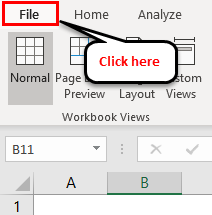 Now, automatically, Excel will place this template file in the appropriate directory. 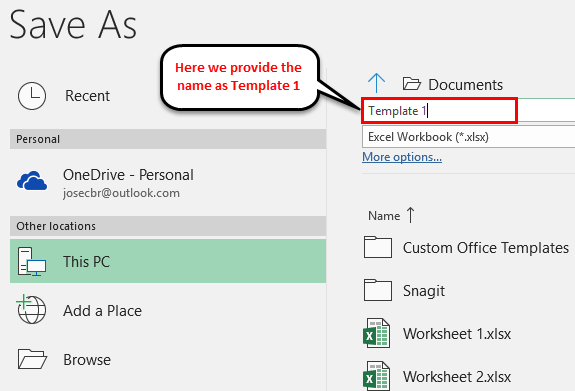 And new Excel documents can be created based on this template file by navigating. 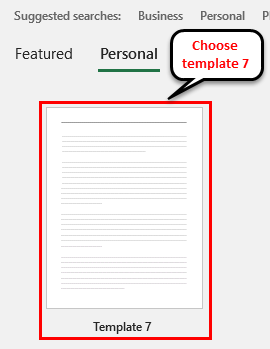 Choose Personal in the new file window (which is right next to Featured) and then choose Template 2. Now, let us look at another example. Firstly, we will make all the changes in the new file, modify it till all the items that you wish to save in the template are ready. Then you have to save the file as a template. Template files have a special extension. In the above screenshot, we have added an image and text as the structure of the template. Now we shall follow the steps below to create the excel template. Step 1 – Firstly, go to File and then click on Save As option (As shown in the above examples). 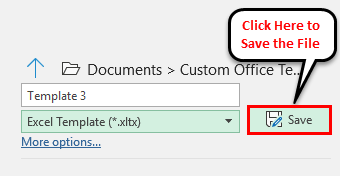 Step 3 – Click on Save button to save the template. Now, let us look at yet another example. Now, we will make all the changes in a new file, modify it till all the items that you wish to save in the template are ready. Then you have to save the file as a template. Template files have a special extension. 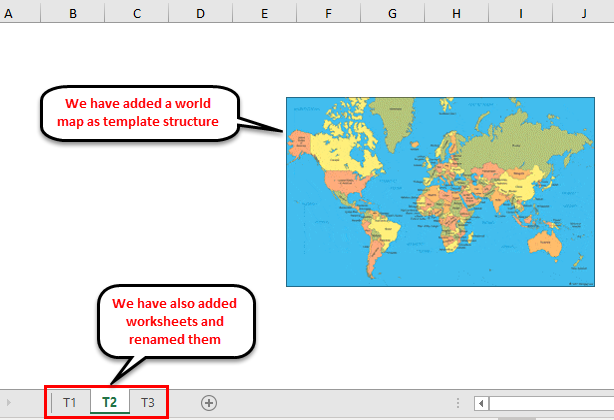 In the screenshot above, as you can see, we have added the template structure – we have added a world map and increased the default worksheets and renamed them, and now we shall proceed to save this file as a template. Now we shall follow the steps below to create the excel template. 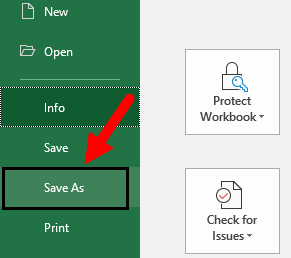 Step 1 – Firstly, go to File and then click on Save As an option (As shown in the above examples). Step 3 – Click on Save to save the template. Now we shall proceed to use a template file to create a new file in excel. We will make use of Example #4 template file. 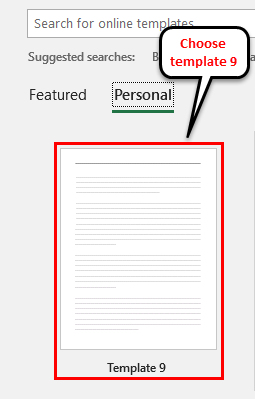 Choose “Personal” in the new file window (which is right next to Featured) and then choose the appropriate template. We shall choose Template 4 as the base and create a new file in excel. As we can see, all the template structures are retained, and the new file is named Template4 1 – the first file based on Template 4. Now we shall proceed to use another template file to create a new file in excel. 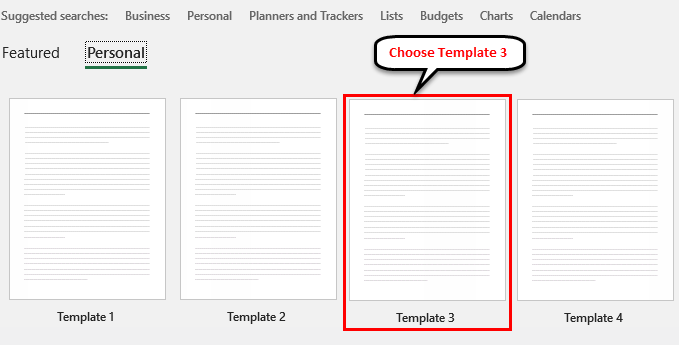 We will make use of Example #3 template file. We shall choose Template 3 as the base and create a new file in the excel. Hence, we can see that the image and the header structure is retained in the new file. 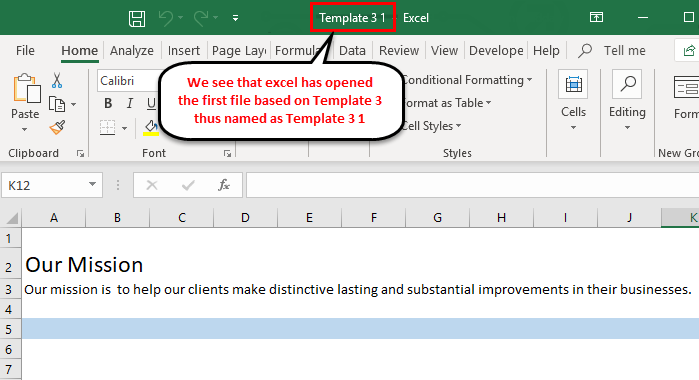 And it is also important to note that this new file is named Template3 1 – signifying that it is the first file based on Template 3. Now we shall create another new template. 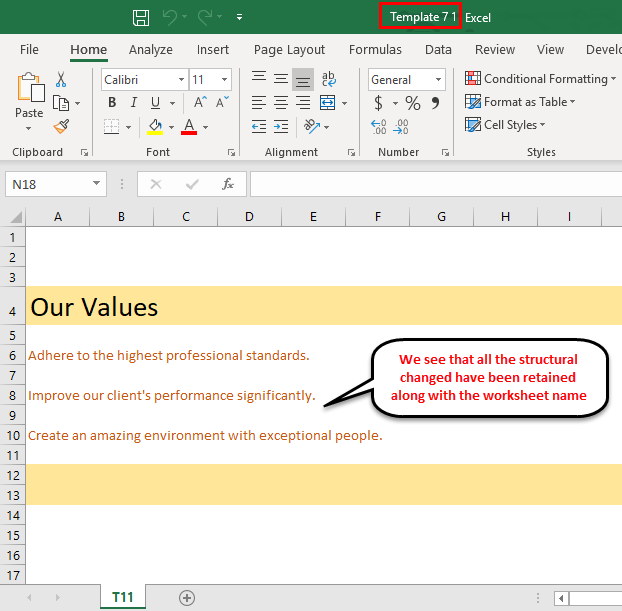 We will create the template structure in excel as shown below. Step 1 – Firstly, go to File and then click on Save As an option (As shown in the above example). 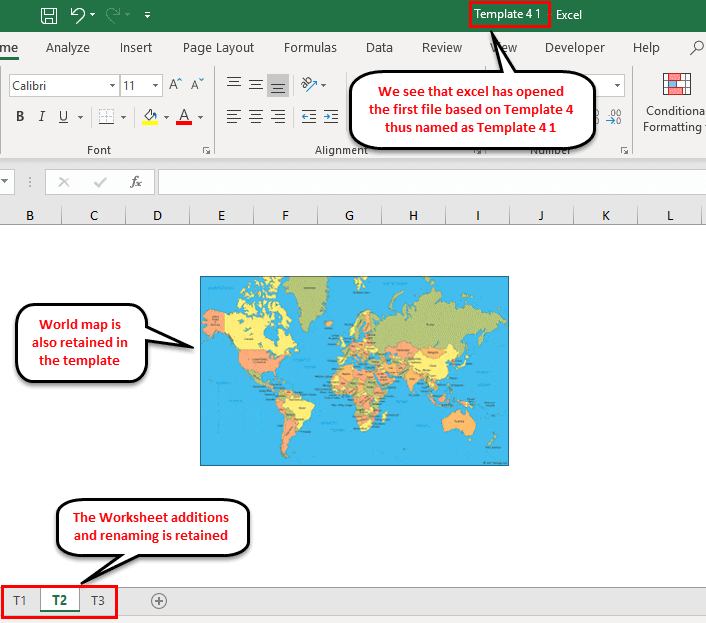 This will create a Template 7 template with the template structure defined in the Default Template location in excel. Now we shall attempt to use Template 7 to create another file in excel. Here we see that we have Template 7 listed. 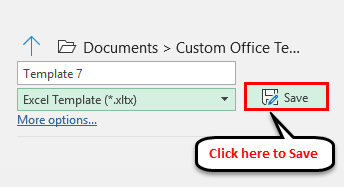 Click on it to create a new file based on Template 7. Now, automatically, Excel will place this file in the appropriate directory. Now, let us see an example where we have Excel formulae in the Template file. Since this is the template, no data is present here. 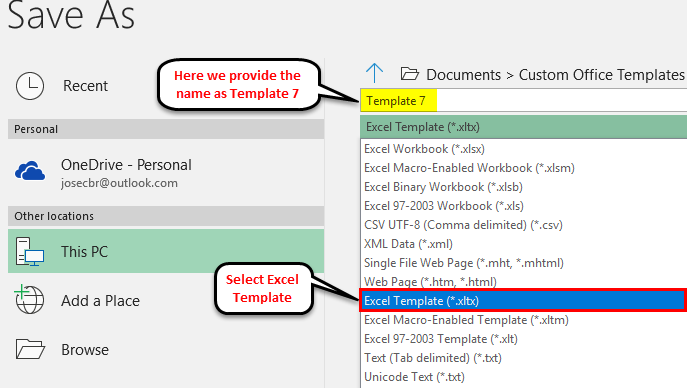 Let us see how to create the template file in excel. 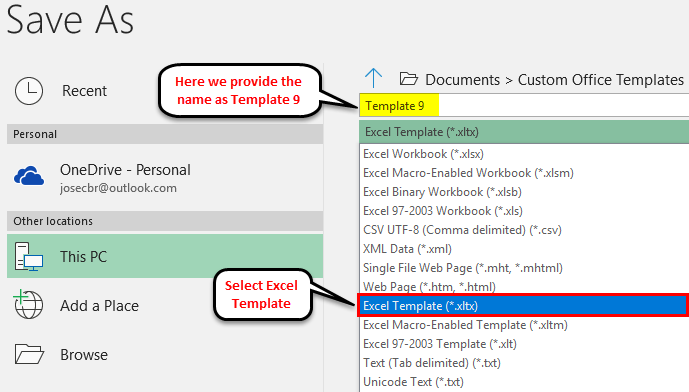 This will create Template 9.xltx template with the template structure defined in the Default Template location. Now, we shall attempt to use the previous example template to create a new file and see if that works in excel. 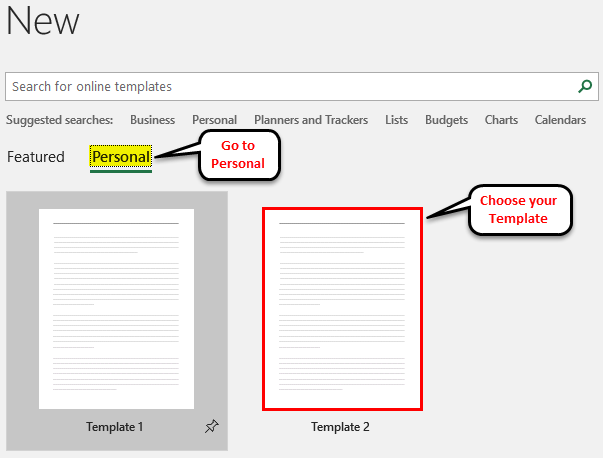 We will go to File -> New -> personal and then find our Template file (in this case it is Template 9) and click on it to select it. 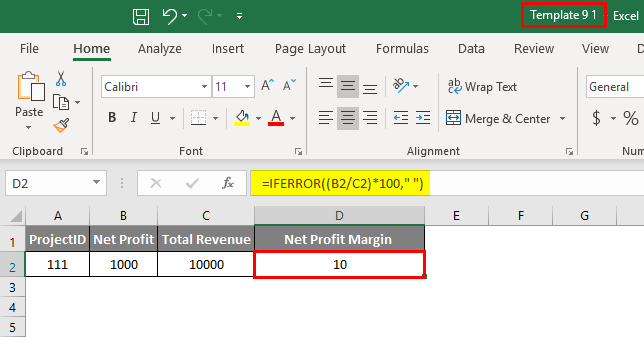 We see that in the new file we have the structure defined and once we feed in the data on Column A, B, and C, the Net Profit Margin in Column D is automatically calculated by using the formula from the Template File. 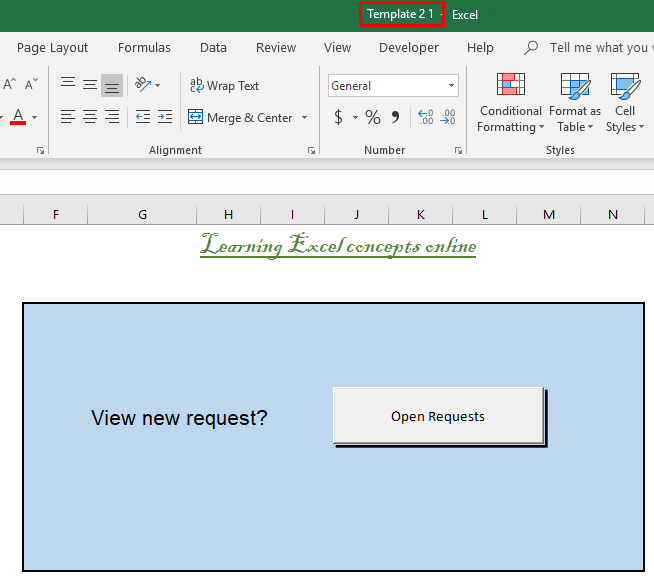 Let us now use our second example – Template 2 to create a new file in excel. 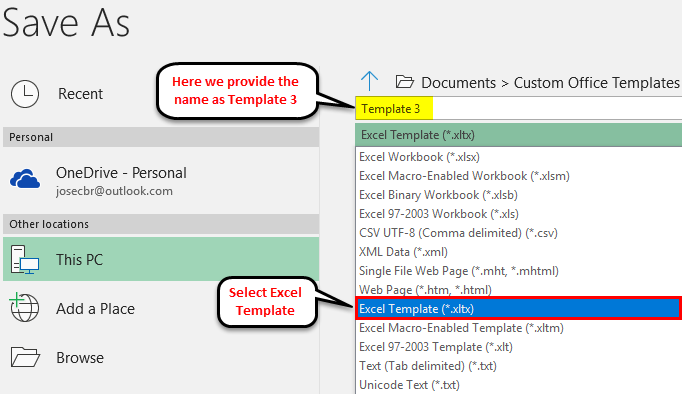 Template2 has a macro defined in it, so let us see if the same is available in the new file. Now let us see what happens when we select “Template2”. It opens up a new file with the same macro (that was defined in the template file) loaded automatically. 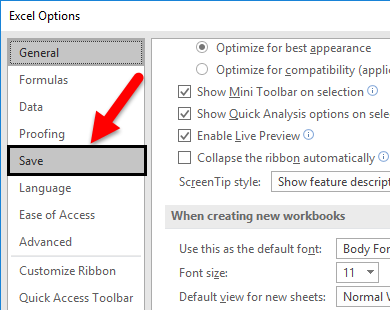 We will need to click on “Enable Content” in the pop-up to enable the macro. Upon enabling content, once we click on the Open Requests button. We will get the desired result. 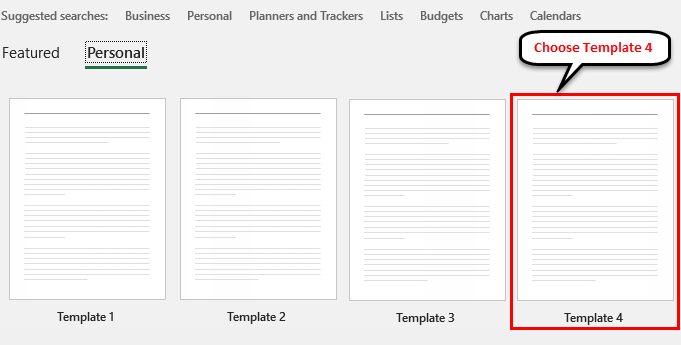 In order to modify the template used to add new sheets in already existing files, the template has to be named xltx or Sheet.xltm and must be saved in the same folder.